by Apostoles, Francisca de los, Ahlgren, Gillian T. W.
Apostoles, Francisca de los, Ahlgren, Gillian T. W.
The Inquisition arrested Francisca de los Apóstoles on a charge of religious fraud. In the 1570s she & her sister established a beaterio, a lay community of pious women & petitioned for ecclesiastical reform in Toledo, Spain. 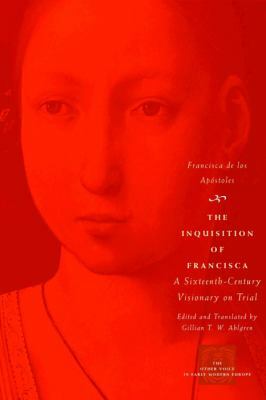 This book is a contemporary account of her prosecution.Apostoles, Francisca de los is the author of 'Inquisition of Francisca A Sixteenth-Century Visionary on Trial', published 2005 under ISBN 9780226142241 and ISBN 0226142248. Loading marketplace prices 145 copies from $4.99 How does the rental process work?